Naidu said that the TDP had to ally with Congress after 37 years of fighting in order to save the country and democracy. Poll-bound Telangana on Wednesday became a platform for scathing digs at Chief Minister K Chandrasekhar Rao (KCR) and Prime Minister Narendra Modi as Congress President Rahul Gandhi and Andhra CM and Telugu Desam Party (TDP) chief Nara Chandrababu addressed public meetings together in Khammam and Hyderabad. The Khammam meeting venue swelled as alliance partners Congress, TDP and CPI and TJS roped in their cadre along with Madiga Reservation Porata Samiti (MRPS) supporters, who have backed the People’s Front. Dalit leaders Gaddar and Manda Krishna Madiga also shared the stage with Naidu and Rahul along with TJS’ Kodandaram, Congress’ RC Khuntia. CPI National Secretary Sudhakar Reddy and local leaders were also present at the meeting. Gaddar called the Khammam meeting a historical one as the alliance was forged to save democracy and the country. He said that it is need of the hour to save the state and country from KCR and Narendra Modi. 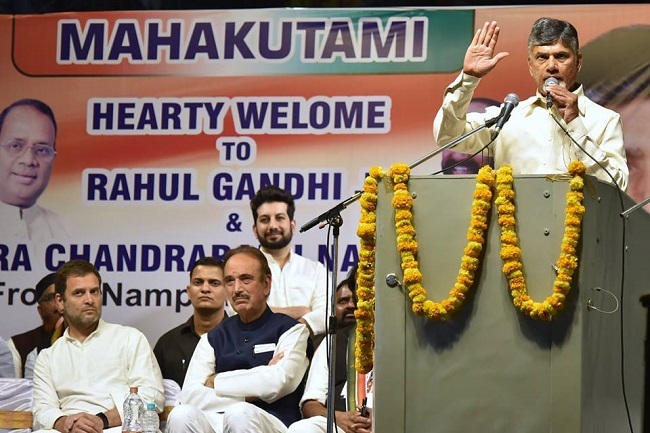 Speaking along the same lines, Chandrababu Naidu also called the Prajakutami a "historical need" and the Khammam meeting will remain in history for accommodating such a platform. Founded by actor-turned-politician Nandamuri Tarakarama Rao (NTR), TDP is one of the parties that emerged against Congress party in the early 1980's. Naidu said that the TDP had to ally with Congress after 37 years of fighting in order to save the country and democracy. He alleged that the Modi-led BJP in the Centre is destroying all the Constitutional institutions for the vested interests of few. The Andhra CM said, "There is a need to work together for the country as the institutions like CBI, ED, IT, and RBI were being destroyed." He alleged that there has been no advantage to the people of the country after demonetisation, he told the gathering that Narendra Modi-led government is the reason behind the cash crunch and troubles that people still facing. While calling the GST (Goods Service Tax) a disastrous move he said that it has broken the country’s' economy and led to inflation affecting the small traders and farmers heavily. Chandrababu Naidu also took potshots at Narendra Modi citing the violence and intolerance against Muslims and Dalits in BJP states, while alleging the Triple Talaq bill was brought in just to panic and create insecurity among Muslims in the country. Chandrababu Naidu also hit out at KCR whom he said is in nexus with the BJP. He asked the people if they understand why KCR is making an attack on him. He said attacking him instead of BJP and Modi is not a just and fair one, he reminded KCR that it was TDP who gave him political life. Naidu said, "Would he have become like this if TDP hadn't supported him? He is attacking me, but I will not criticise him, I will work for Telangana and country." Naidu said that KCR is blaming me for halting the development of Telangana, though he was seeking the fulfilment of bifurcation promises. He asked KCR why he is not questioning Modi for what is due to Telangana as per the act. Naidu also alleged that KCR turned the surplus budget state in to debt ridden one and a hub of unemployment despite opportunities. The TDP Chief while claiming that all the institutions are being misused appealed to people to be careful with the EVM machines. He asked people to check the VVPAT to know whom they voted for. "Be careful with EVMs, check whom your vote has gone to. It is our right to know." Taking jibes at the BJP election management and the alleged flow of money he said, "BJP doesn't have votes here but money, they're roaming here and there.” He also said, "I never said I developed Hyderabad, but I shaped and developed Cyberabad which is true.” This was in response to KCR's recent remarks. Rahul before taking the centre stage was seen keenly observing Naidu's speech. Like Naidu, he alleged that the Supreme Court, CBI, RBI and Election Commission were being destroyed. Calling KCR the BJP’s B team, he urged the people to unseat his government, stating, "The same front will defeat the BJP B team in Telangana and the A team in other poll-bound states Rajasthan, Madhya Pradesh, Chhattisgarh in upcoming general elections in 2019 in Delhi". He also assured that Congress wished to fulfil the bifurcation promises made to both the states in the Act such as the Bayyaram Steel plant, Tribal University, special incentives and rail coach factory in Telangana and Special Category Status, Steel plant in Kadapa and other projects. The Congress chief also asked people to question KCR as to why was he is supporting Modi for four years despite the betrayal. He also alleged that KCR has doomed the youths and poor by not fulfilling the promise of 1 lakhs jobs and pakka house to homeless in Telangana. Rahul has also accused the Telangana CM of wasting public money by redesigning the projects which were already initiated by the then Congress government. He also alleged that KCR redesigned the BR Ambedkar Pranahita Chevella project and renamed it as Kaleshwaram project, he said, "The costly name changing project in the world that took Rs 40,000 crore." Rahul said Prajakutami will work for employment and pakka houses along with land distribution to landless in the state along with loan waiver of Rs 2 lakh to farmers. The duo also addressed another meeting in Hyderabad's Sanath Nagar area in Kuakatpally Assembly constituency from where Nandamuri Suhasini of TDP is contesting. Wednesday's rally's by Rahul Gandhi and Naidu boosted the morale of the cadres of Prajakutami, even as lone rider TRS supremo KCR continued to tour districts in Telangana.